I just tried using the Dropbox form integration with "Send a File." Went to test my form, and when I tried to upload a PDF, the button immediately said "Failed," clearly without even trying to upload the file. I've recreated the form several times, re-linked with Dropbox, etc, no luck. What gives? Your form is working on my end. Please do check if you received the pdf that I sent. Upon choosing files, the form automatically uploads and shows progress. If you do receive in your dropbox the pdf that I uploaded, then surely the problem is on your end - either with your internet connection or your browser. Hope that helps. Apologies for the large pdf file. I did get it working finally, thanks. Not sure what the issue was. 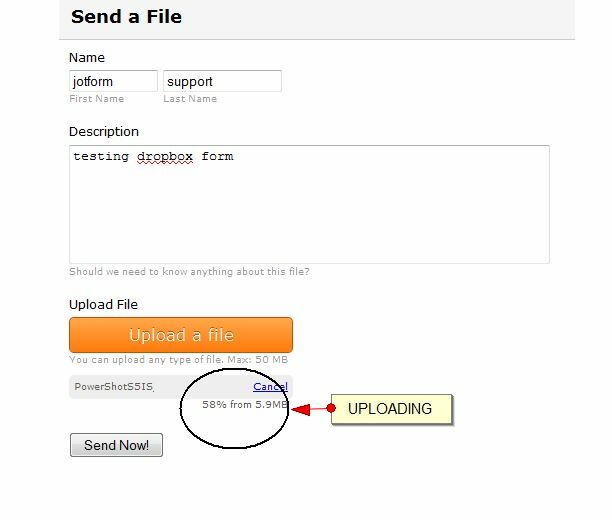 Is there any way to make the PDF itself upload to Dropbox, or does it always have to link to the Jotform file, which then contains a link to the PDF on the Jotform servers? The PDF is uploaded both on Dropbox and on our server. Refresh your dropbox folder, it may take some time to appear. Dropbox automatically creates a folder for every submission. For every submission, you will also receive a PDF file with the information with details about the form submission. It would also be best if you can install their software that automatically syncs in data to your computer once a submission has been made. Thanks for your fast answer... I keep creating forms but it seems that dont sync neither with my pc nor my dropbox.... what i'm missing??? no folder was created neither trying a number nor a name... I tried to create folder in dropbox first but seems it doesnt work either! what i'm missing? Let's go back to basics and reconfigure your JotForm-DropBox integration settings. 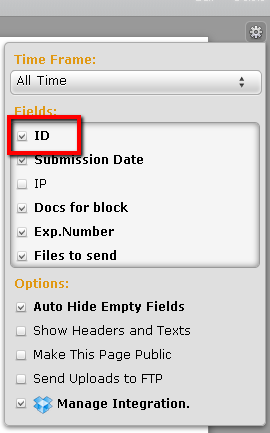 Instead of "Exp Number," could you please use the default folder name "Use default - Submission ID" folder? b) Inside this new JotForm folder, Dropbox automatically creates a subfolder for each of your form as soon as it begins receiving files from the form/s. Please try this setup and let us know if it works for you or not. Thank you for using JotForm! no, it's not working for me... do I need this ID field to be created in the form??? If it still doesn't work, I would recommend deleting the Dropbox integration settings and set it up again, this time using the above steps. We apologize for the inconvenience. I see, the JotForm folder should be created by Dropbox in your Dropbox dashboard. 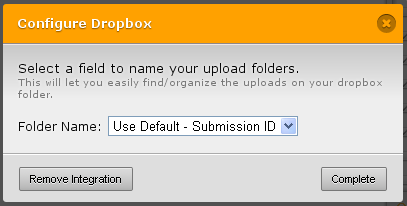 And this folder will only be created right after someone successfully uploads a file and submits your form. If someone completes your form, kindly check your Dropbox dashboard and look for the JotForm folder that will be automatically be created by Dropbox. Yes I tried so and seems that doesnt work! any other clues??? Hmmm.. I am pretty sure you entered the correct Dropbox account in the Dropbox integration wizard. That's the only thing I haven't checked with you. Sorry if it sounds too basic, but I myself am gulity of overlooking the smallest things! Kindly double check if the Dropbox account you entered in your JotForm settings is accurate. We hope we'll finally nail it this time, discert. Thank you for your patience and for using JotForm! I installed other APPS (like dropitome) and work OK! That's good to hear, discert. You nailed it! We hope you enjoy this new JotForm-Dropbox integration feature. If you have any other questions or concerns, please do not hesitate to share it with us.